Zenith Campus Recruitment team has recruited in eight colleges and universities of Beijing, Jinan, Tianjin, Hefei since the beginning of 2011. Full harvest in the northern region, Zenith will arrive at the Nanjing Railway Station today. 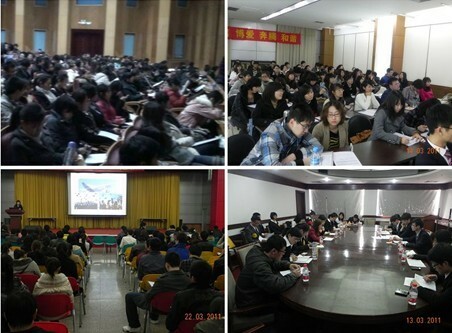 At 18:30 on March 7, 2011, the first zenith campus recruitment lecture was held at the Science Hall, at Shandong University in Jinan. Half an hour before the start, there were two long queues of students in front of the Science Hall. Many students had clear post intentions and consulted the recruitment team in advance. The entire propaganda was lively, the host quipped, a zenith full of vitality and passion showed up in front of students. Only the day of recruitment, they received more than 500 resumes. "So different!" a student said, "before I heard a lot of seniors who work at zenith. I was curious about their work. I did not expect zenith has such a great development now! For employment, I most value the development of space and the team atmosphere, zenith is definitely the best career platform to take off, I really hope to join the team! " "By March 24, we have received nearly 7,000 resumes, an increase of 35% year on year." Zenith Human Resources Department was very excited, "In just one year we have got such a great increase, which depends greatly on the company development in recent years." Zenith 2011 campus recruitment program is going to recruit 115 elites for 10 posts, including business management, mechanical / technical elite, and other international marketing positions. Candidates on the current situation in perspective, an average of 60 people are competing for one post. Talking about the recruitment of this year, the Group Chairman appreciated the theme and this year's recruiting philosophy - looking for people who see the future, and that the recruitment in the future, we must put quality before quantity. We value education, but not just the degree; we need excellent people, but we need to identify and match them with the company values and culture. We need elites who have vision and common sense, firm confidence in the future, and work hard with our common cause. On the afternoon of March 25, Zenith recruiting team will come to Nanjing University, launching the Nanjing station recruiting trip.